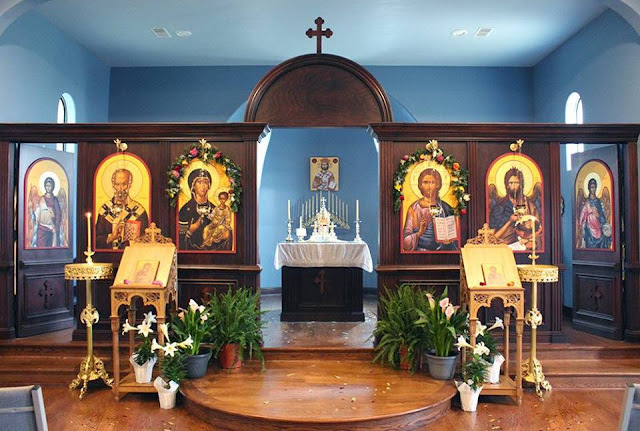 Holy Week begins on Lazarus Saturday through the celebration of Pascha (or Easter). 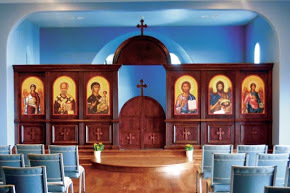 The Orthodox Christian Church offers special services every day during Holy Week leading us through the events in the last week of Christ's life to his death and Resurrection. We'd love for you to visit during any of these services! 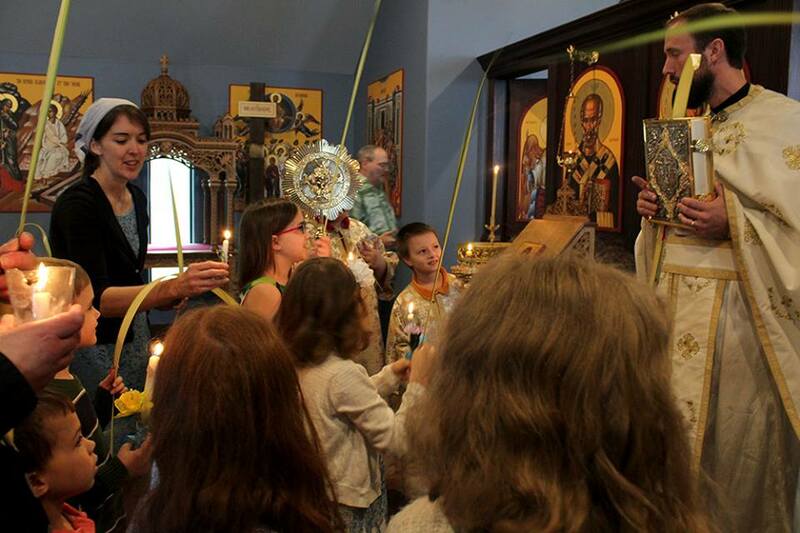 Read below about the meaning and celebration of each service, with pictures and videos. Lazarus Saturday is the beginning of Holy Week. It commemorates the raising from the dead of our Lord's friend Lazarus, who had been in the tomb four days. This confirms the universal resurrection - that Christ will raise us all from the dead at his Second Coming. This miracle led many to faith in Christ, but it also led to the chief priest's and Pharisees' decision to kill Jesus (John 11:47-57). 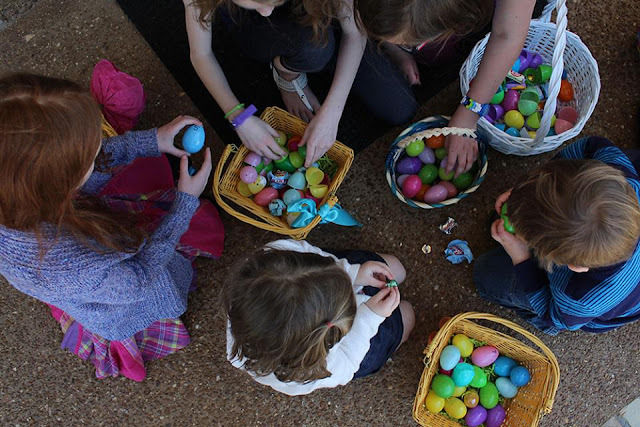 This day is celebrated as a mini-Easter before beginning the hard work of Holy Week, so after the liturgy we enjoy a potluck and games and an egg hunt for the children! All are invited to stay and play! On Palm Sunday, Christ enters Jerusalem, and the people proclaim him as king - but in an earthly sense, because the people of His time were seeking a political Messiah. Our Lord is King, of course, but of a different type. 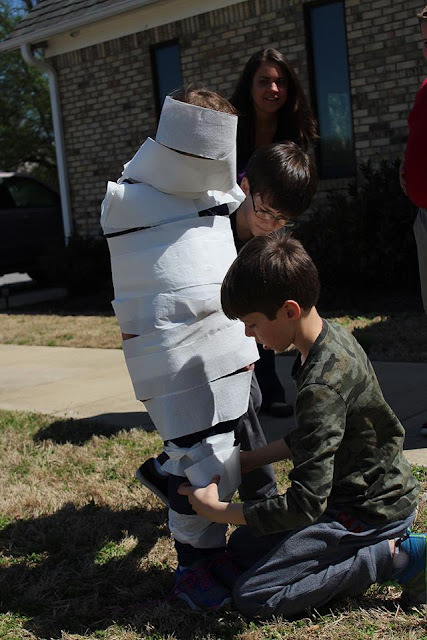 So on this Sunday, we carry palms like the people long ago in a procession around the church singing, "By raising Lazarus from the dead before your passion you confirmed the universal resurrection. Like the children with the palms of victory we cry out to you, O Vanquisher of Death, 'Hosanna in the highest! Blessed is he who comes in the name of the Lord!'" In this, we show that we too accept Jesus as the true King, Who we are willing to follow - even to the cross. 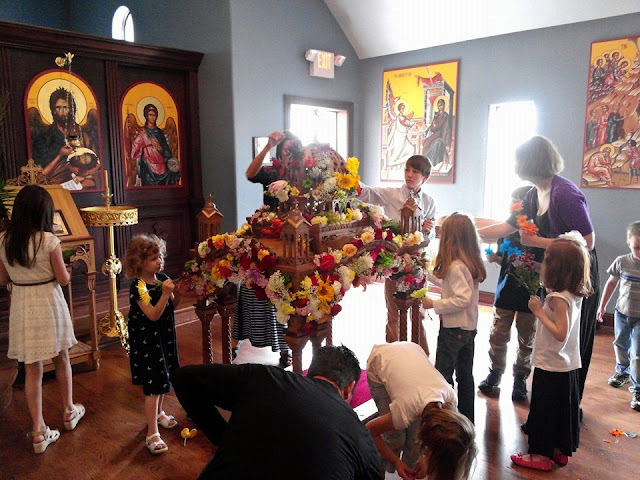 The palm leaves we carry in procession are blessed, and many families fold them into a cross, and take them home to keep in their prayer corner. First, a brief explanation. These services, and most of the services of Holy Week, are "sung in anticipation" meaning they are moved ahead twelve hours. This means the evening service is actually the service of the next morning, and the morning services of Holy Thursday and Holy Saturday are actually the services of the coming evening. These evening services of Holy Sunday, Monday, and Tuesday are known as the Bridegroom Orthros. On Sunday, the priest carries the icon of Christ the Bridegroom in procession, and we sing the "Hymn of the Bridegroom." Each of these Bridegroom Orthros services has a particular theme. On Holy Sunday evening, we remember the Blessed Joseph, the son of Jacob the Patriarch. Joseph is often seen as a Type of Christ, betrayed by His own, and sold into the slavery of death. The Gospel reading for the day is about the barren fig tree, which Christ cursed and withered because it bore no fruit. The fig tree is a parable of those who have heard God's word, but who fail to bear the fruit of obedience. On Holy Monday evening, we read the Parable of the Ten Virgins. It tells the story of the five virgins who filled their lamps in preparation for receiving the bridegroom while the other five allowed their lamps to go out, and hence were shut out of the marriage feast. This parable is a warning that we must always be prepared to receive our Lord when He comes again. The theme of Holy Tuesday evening is repentance and forgiveness. We remember the sinful woman who anointed the feet of our Lord in anticipation of His death. Her repentance and love of Christ is the theme of the wonderful "Hymn of Kassiane" which is chanted on this night, reminding us one more time, before "it is too late," that we too may be forgiven if we repent. On Holy Wednesday, we receive the sacrament of Holy Unction, in which people are anointed with blessed oil for healing. While Orthodox Christians may receive this sacrament at any time they are sick, during Holy Week, all the faithful receive it because we know that our Lord’s death and Resurrection are for our spiritual healing as well: “By His stripes we are healed” (Isaiah 53:5). We should prepare for this service in a prayerful way, as we do for Holy Communion. 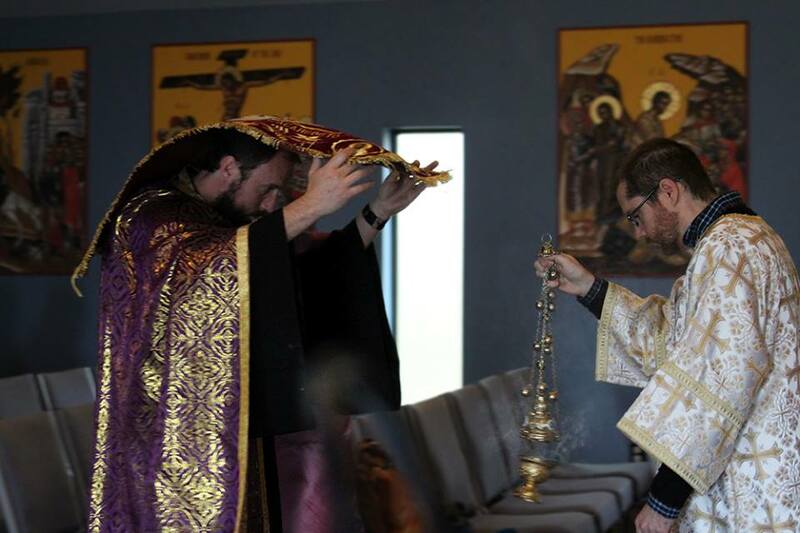 On Holy Thursday, we serve the Vesperal Liturgy of St. Basil commemorating the last supper, that is the first Mystical Supper when Jesus washed His disciples’ feet and instituted the Eucharist (or Holy Communion). We sing, "Receive me today, Son of God, as a partaker of Your mystical Supper. I will not reveal Your mystery to Your adversaries. Nor will I give You a kiss as did Judas. But as the thief I confess to You: Lord, remember me in Your Kingdom." Thursday evening begins the services of Great and Holy Friday. The service of the Twelve Passion Gospels remembers the solemn time of our Lord's Crucifixion. As we read each of the 12 gospels we light a candle at the front of the church. After the reading of the fifth Gospel, the holy cross is carried around the church in procession, and Christ's body is nailed to the cross in the center of the church. 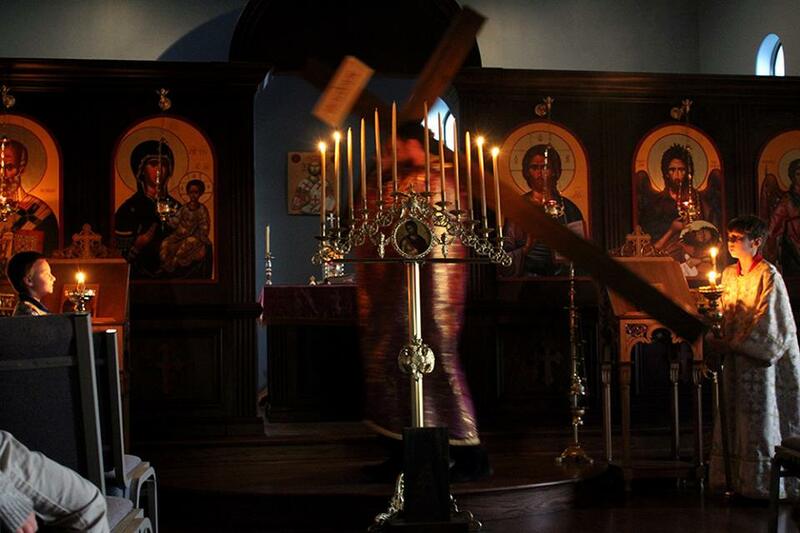 The faithful are invited to come venerate the cross. Members of our parish built and painted our beautiful icon of Christ, and we eagerly look forward to bringing it into the church each year. The 12 Gospel readings make this service a little long. However, it helps to know that they are arranged from longest to shortest, so the last 6 go faster than the first 6. Even if you can't stay for the whole service, you won't want to miss the procession in the middle! On Holy Friday morning, we again contemplate the crucifixion, reading some sections from the Gospel readings from the previous service. 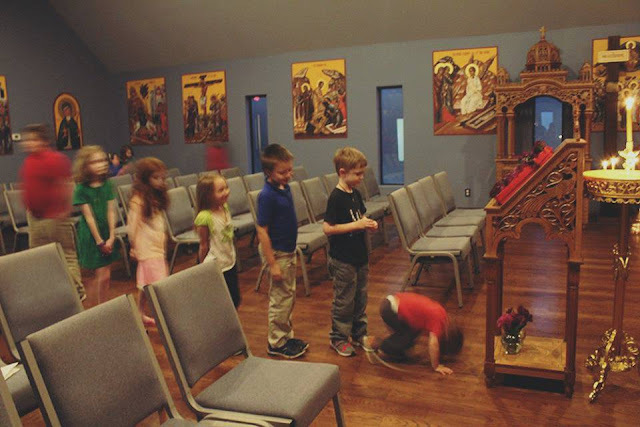 After Royal Hours, many people, especially the children, gather and bring flowers to decorate the funeral bier in preparation for the next service. This is a beautiful act of love for our Lord, following the example of the myrrhbearing women, that our children look forward to each year. The funeral bier will be used in the services later in the day. 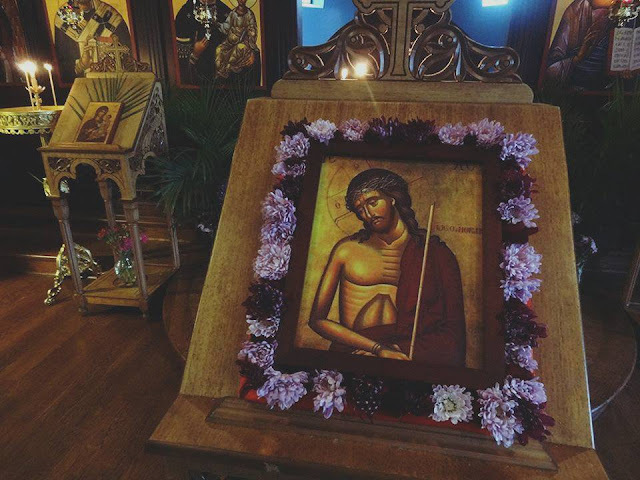 During this Vesper service, we take down the icon of Christ's body from the cross and wrap it in a new, white linen sheet. This act commemorates the removal of Christ's body from the cross by Joseph of Arimathea (John 19:38-42). 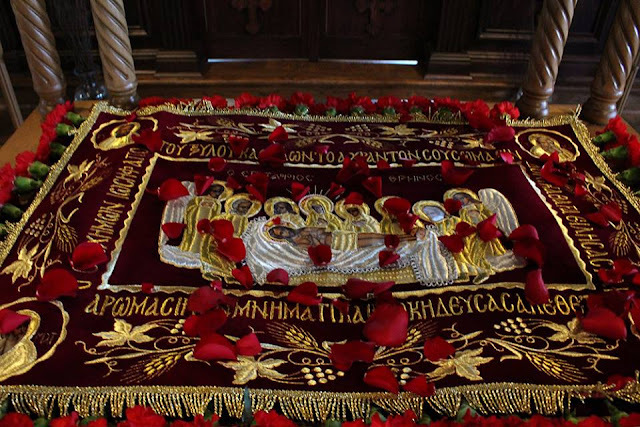 Later in the service, the Epitaphios, or winding-sheet, with the icon of Christ's body is carried in procession and placed in the recently decorated funeral bier. This service is one of the most popular because it is not as long as some of the other services of Holy Week, and it is quite beautiful. 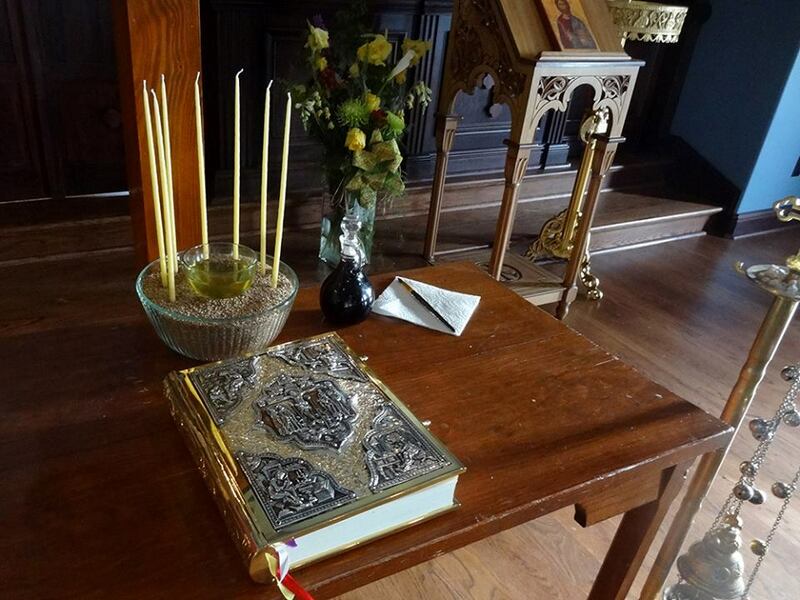 Afterward, with Christ in the tomb, we begin a vigil in which parish members take turns reading the Psalms continuously until the resurrection (on Holy Saturday evening). 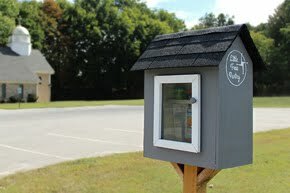 Members can sign up to take a turn reading, and anyone can come and pray or listen to the Psalms during this time. The Epitaphios is an icon of the Lamentation showing Christ's body and the faithful lamenting his death. It was placed on the decorated bier during the Holy Friday afternoon service, and is now carried in procession around the Church, much like a funeral procession. The people re-enter the church by going under the bier, an act reminiscent of our baptism and our union with Christ as he goes down into Hades. The many readings and hymns of the Holy Friday services present us with many different facets of the awesome and compelling mystery of our Lord’s Passion. 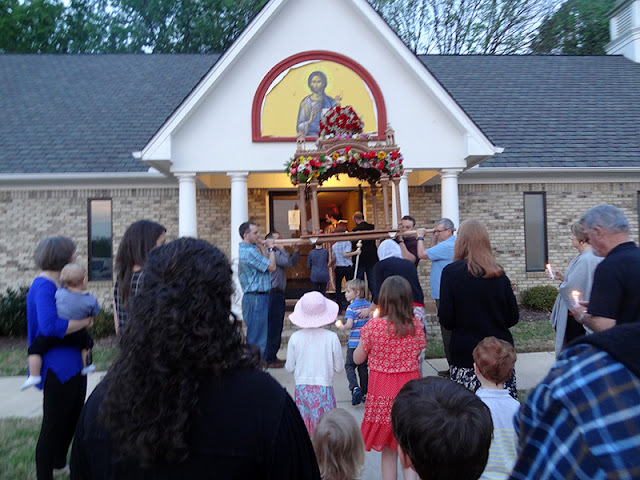 After returning to the church, the Epitaphios is taken from the bier into the altar, symbolizing Christ’s body being placed in the tomb, which will also be the place of Resurrection. Harrowing Hades with the throwing bay leaves and rose petals! Holy Saturday is the day on which God rested — in the Tomb, which Orthodox Christians understand as the fulfillment of God's rest in Genesis 2:2. It is the most appropriate time for Baptism, as those baptized are ‘buried’ with Christ to share His Resurrection (Romans 6:3-4). Lent has its origin as an intensive preparation for baptism, and so today the Church still often baptizes catechumens on this day. Today we read the 15 Old Testament readings that illuminate Baptism, including the Creation from Genesis and the Exodus, and we read the first Resurrectional Gospel from Matthew 28. The priest wears bright vestments today as we anticipate Christ's Resurrection. 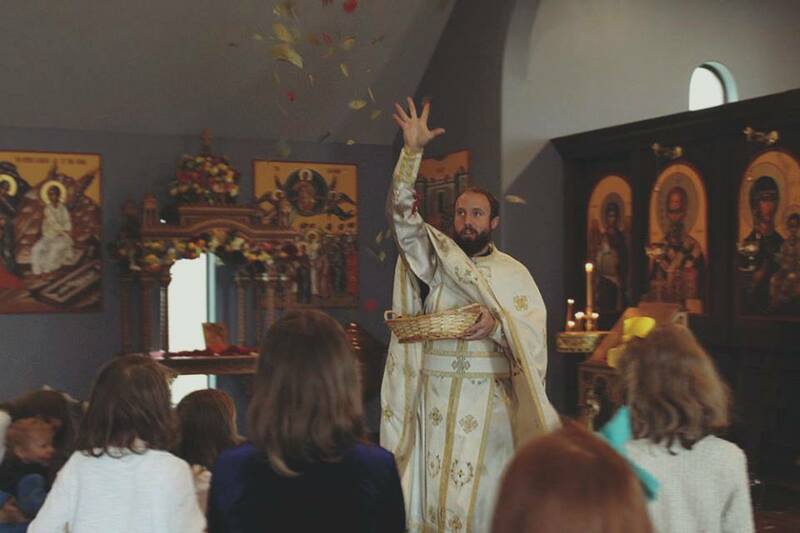 During the service he joyfully strews laurel leaves and rose petals throughout the church during the service, because in the ancient world laurel leaves were a sign of victory. As the leaves are strewn, the choir chants "Arise O God and Judge the earth, for to Thee belong all the nations." The resurrection is near! This is the most important service of the year for Orthodox Christians, and no one wants to miss it! This is the celebration of the resurrection. At midnight all lights in the Church are turned off and all the candles put out. This is the darkness and silence of the Tomb. 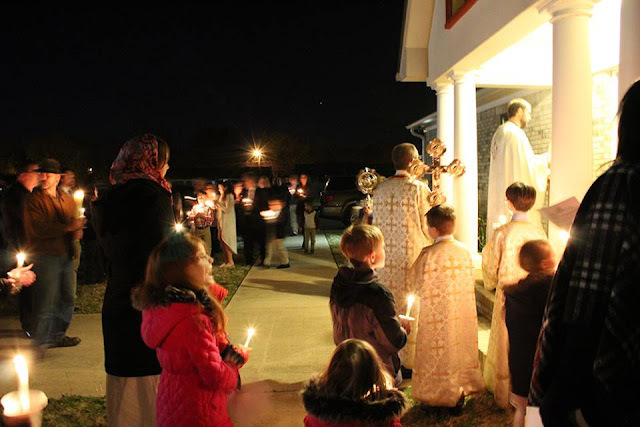 Finally the priest comes out of the altar with a candle while singing "Come receive the light from the light that is never overtaken by the night, come and glorify Christ risen from the dead." Everyone comes forward and lights a candle from this light. Carrying the candles, we make an outdoor procession to the front door of the Church. There we hear the greeting ‘Christ is Risen!’ for the first time and reply, ‘Indeed He is Risen!’ We greet each other this way for forty days. 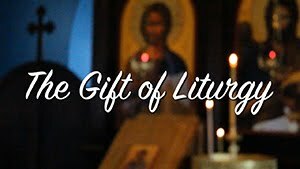 We go into the well-lit church and sing the joyous Paschal Orthros and break the Lenten fast with the Divine Liturgy, and receive the Body and Blood of the Risen Lord. 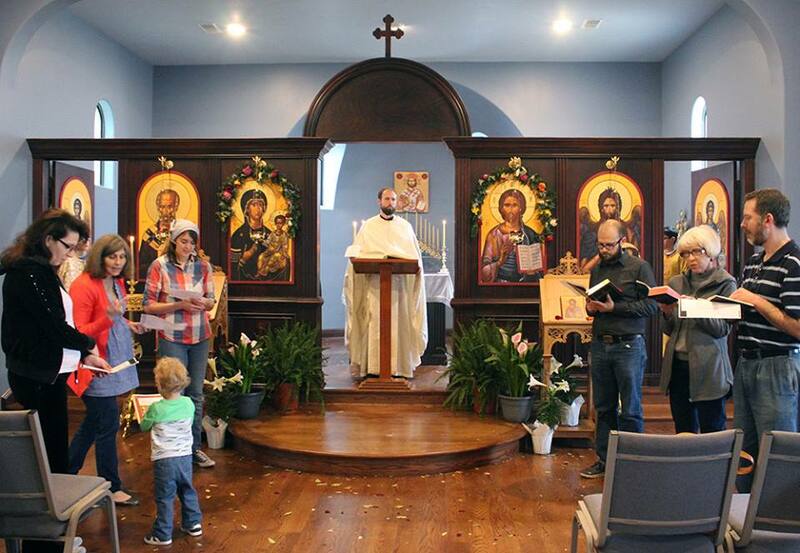 After this service, the priest blesses our Easter baskets, and we go to the parish hall to find the tables sagging with every kind of good food, and we celebrate together until quite late. The video below includes clips from our first Paschal celebration in 2015. 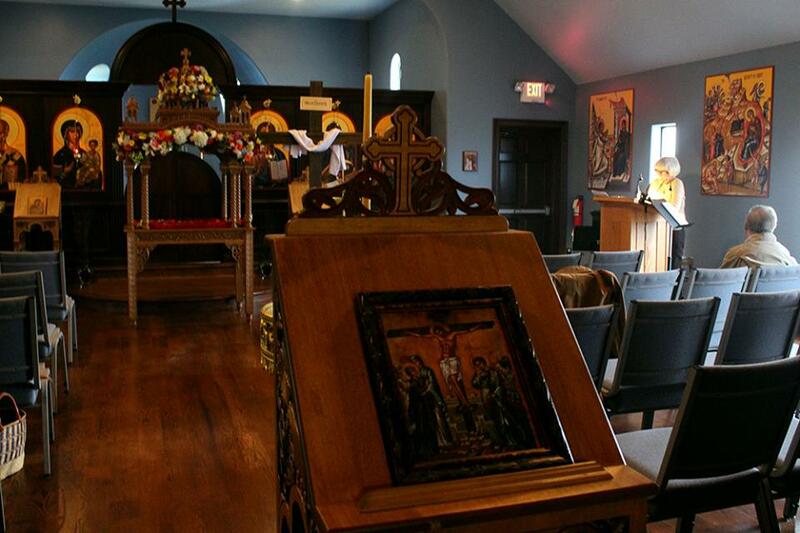 There is no morning service because the midnight service was the Sunday Liturgy. However, we gather for the joyous Paschal Agape Vespers in the afternoon. During this service we read the resurrection Gospel in many languages to celebrate how the Gospel was spread throughout the world. Members are invited to read the Gospel in any language they speak so that we represent as many languages as possible! After the service, we continue feasting with our Agape picnic, games and egg hunt, or just a little relaxing. Print this handy guide to Holy Week! Print two sided and fold into a pamphlet to keep the list of services and their explanation with you.